Bangkok (Thailand) – October 12, 2018 (travelindex.com) – H.E. 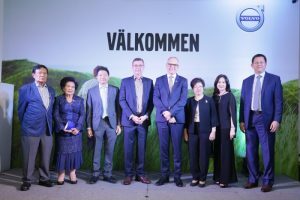 Mr. Staffan Herrstrom (4th from right), Ambassador of Sweden, recently presided at the grand opening of Volvo Witthayu, Thailand’s first Volvo Retail Experience (VRE) Showroom and Service Center operated by GT Auto Co., Ltd. Centrally located at the intersection of Wireless and Sarasin Roads, Volvo Witthayu is designed according to Volvo’s new “Designed Around You” concept and service philosophy as well as equipped with Volvo’s latest state of the art technology and technicians fully-trained by Volvo. Pictured from left are: Dr. Sribhumi Sukhanetr, Honorary Consul-General of Monaco; M.R. Waranaporn Sukhanetr, Mr. Winn Santipongchai, CEO of GT Auto Co., Ltd.; Mr. Chris Wailes, Managing Director of Volvo Car (Thailand) Ltd.; H.E. Ambassador Staffan Herrstrom; Mrs. Netra Ruthaiyanont; Mrs. Naddawadee Santipongchai; and Mr. Danai Chandrangam, General Manager of GT Auto Co., Ltd.